TLDR: 5 stars for sweet, beautifully written, poignant stories. Pavane is a delicate and beautifully written novel, presented in six stately measures with a concluding coda. 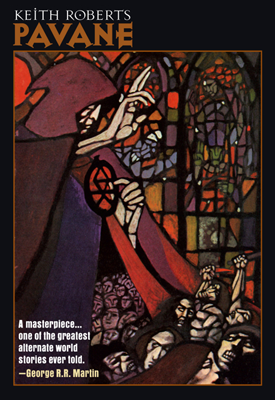 It presents a version of Angleland in 1968, a version where Protestantism was destroyed in the 16th century and the catholic church still has a heavy influence on society. It is a place of steaming, metallic road-trains, clacking semaphores, and white boats smuggling foreign machines ashore. Many places, like Durnovaria and Londinium, retain their latin names. Each of the 6 chapters is a short story. Each stands alone, but they are connected by characters. The Lady Margaret features a steam haulier who, though he loves his engine (Iron Margaret), is lonely for female company - but then comes across an old friend. The Signaller follows an apprentice semaphore operator (member of the signaller's guild) when he is assigned to a lonely station and has a run in fairies. The White Boat tells the story of a young lady who becomes fascinated with a white boat in her black cove and gets mixed up with smugglers, who take her for a ride. Brother John shows us a brewing monk who becomes disenchanted with the inquisition. Lords and Ladies reveals something about the relationship between nobles and commoners, men and women, hope and despair. Corfe Gate tells the story of the Lady of Corfe Gate and her rebellion against the church. The short coda at the end looks back from a more distant future upon this past and closes a loose end. Man! I went looking for this and never found it years ago. Thought someone was pranking me! Turns out I thought it was written by Kenneth Roberts, the USian historical fiction writer, whose ouvre I have read much of over the years. D'oh! Love this novel, one of the gems of the British new wave.